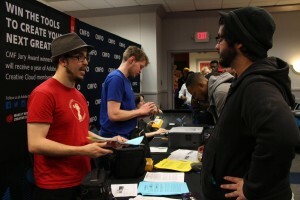 Campus MovieFest, the world’s largest student film festival, returned to Georgia State on Wednesday. An annual design competition brigning together the creative minds of Georgia State’s student filmmakers, Campus MovieFest (CMF) is one of the most anticipated events of the year. Sheza Tariq, the Central Tour Promotions Manager for Campus MovieFest, believes that Campus MovieFest provides a unique experience from most student competitions. On Wednesday, students interested in participating were able to pick up their shooting equipment and begin filming their projects. Students are given a week to shoot, edit and complete their short films for the finale on Feb. 16. Tariq, formerly an active member in the competition, recalls her experience with Campus MovieFest. All students at Georgia State are encouraged to participate. Tariq believes Georgia State’s diverse student body complements the competition perfectly. Although the finale is still just a week after the issuing of equipment, Tariq explains how this year’s competition is different from previous years. “We still show the top 16 movies in the finale showcase, but we’ve decided to eliminate a majority of the superlatives this year,” Tariq said. “The top 4 movies get screened in Hollywood, but nobody knows who the winners are until the finale. We’re still awarding the ‘Best Actor’ and ‘Best Actress’ superlatives, though.